At the November 21, 2000 meeting of Charleston, WV’s The Norwood Building Inspectors, a paper was presented on behalf of Joanna Polatynska and Catharina Polatynska, that attempted to identify the Warsaw theatre that the King of Bohemia met Irene Adler. It’s a quick read and worth a few minutes of your time. Finally we have the last question to consider – why Warsaw? The King of Bohemia could easily have met the well-known American actress in Prague, Cracow, Vienna or any other European city. We believe that Sir Arthur Conan Doyle chose Warsaw because of a person, who perhaps was the model for Irene Adler. That person was the Polish actress of international fame, Miss Helena Modjeska. Miss Helena Modjeska was the main actress of The National Theatre until 1876, when she left Warsaw and went to San Francisco, California. In 1883 she became an American citizen. In years 1880 – 1885 she played in London, where Sir Arthur might have seen her. As to her private life, it was quite similar to Miss Adler’s. She was very popular and she had lived rather gay life in high society until she married Count Chlapowsky and became the loving and faithful wife. Miss Modjeska had several artistic tours in the United States and Europe. After she became American, she performed several times in Warsaw and Cracow. So, as you can see, the American actress in Warsaw was not as improbable as it might have seemed. Born in Kraków, Poland, on October 12, 1840, Modjeska made her stage debut in 1861 as Helena Modrzejewska, taking her husband’s stage name as her last name (when travelling abroad, she simplified her last to Modjeska). In 1865, she left her husband in Vienna and returned to Krakow. In 1868, she married a Polish nobleman, Karol Bożenta Chłapowski, and relocated to Warsaw. It was in Warsaw where her reputation was established in the theatre over the next 8 years. She, and her husband emigrated to the United States in 1876, settling near Anaheim, California. 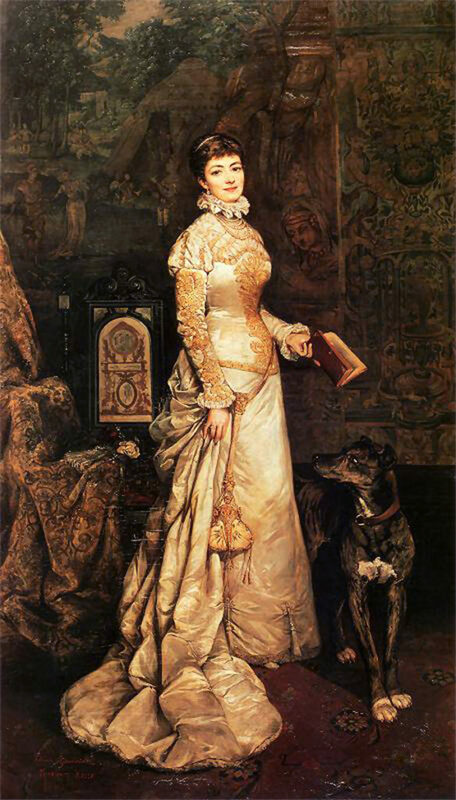 She travelled abroad during 1879-1882, mostly in London, in an attempt to improve her command of the English language, before returning to perform in the States. She became a United States citizen in 1883 and spoke to a women’s conference at the Chicago World’s Fair in 1893. She would pass away on April 8, 1909 in Newport Beach, California. To get a more detailed biography, please check out her Wikipedia entry. 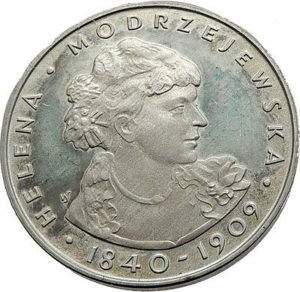 In 1975, the Polish government issued a 100 Zlotych coin that honored Helena Modrzejewska. 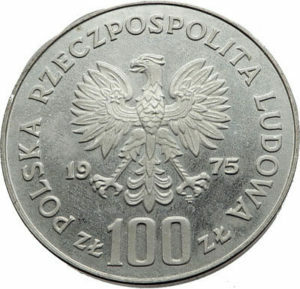 Designed by Stanislawa Watrobska, 60,158 coins were struck in proof condition for sale to coin collectors. Today, examples of this coin can be found on major online auction services for purchase.